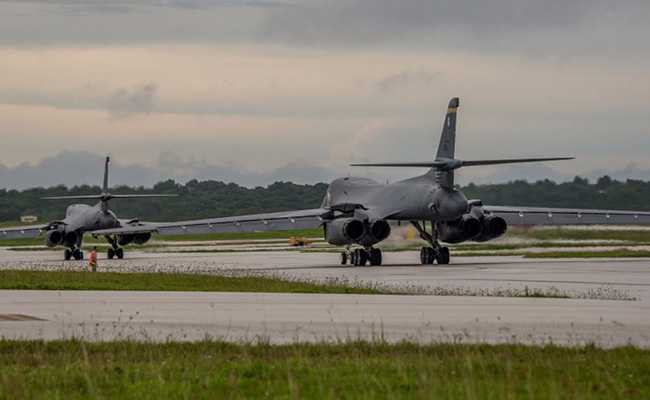 Two B-1B Lancers based in Guam flew a mission in the vicinity of the Sea of Japan late Tuesday, the US Pacific Air Forces said in a statement. The US has flown two supersonic heavy bombers over the Korean peninsula in a show of force against Pyongyang, staging the first night-time joint aviation exercises with Japan and South Korea. "Flying and training at night with our allies in a safe, effective manner is an important capability shared between the US, Japan and the Republic of Korea and hones the tactical prowess of each nations' aviators," Major Patrick Applegate said in a statement. South Korean defence authorities on Wednesday said the bombers staged a simulated air-to-ground missile firing drill with two South Korean fighters over the Sea of Japan (East Sea). The four aircraft then flew across the peninsula and staged another round of a firing exercise over the Yellow Sea before the two B-IBs returned home, the South Korean Joint Chiefs of Staff (JCS) said. "This drill was part of a routine deployment training aimed at enhancing deterrence" against the North Korea's nuclear threats, the JCS said in a statement. "Through the practice this time, South Korean and US air forces showed off the allies' resolve for strong retaliation against North Korea's nuclear and missile threats," it added. The B-1Bs also conducted exercises with Japan's Air Force in what the US statement called a "sequenced bilateral mission". Tensions over North Korea's weapons programme have soared in recent months with Pyongyang launching a flurry of missiles and conducting its sixth and most powerful nuclear test last month. Its actions were in defiance of multiple sets of United Nations sanctions, prompting US President Donald Trump to threaten military action against the regime. The exercises came as a US nuclear-powered fast-attack submarine, the USS Tuscon, made a call in South Korea's southern port of Jinhae, the US Pacific Command said. It did not say when the Hawaii-based submarine with a crew of around 150 would depart the peninsula. The last flight by US bombers was 17 days earlier when four US F-35B stealth fighter jets and two B-1Bs flew over the peninsula. The bomber drill came as US President Donald Trump on Tuesday discussed "a range of options" with his national security team to respond to North Korea's recent missile and nuclear tests. The briefing by his defense secretary James Mattis and top military officer General Joseph Dunford "focused on a range of options to respond to any form of North Korean aggression or, if necessary, to prevent North Korea from threatening the United States and its allies with nuclear weapons," according to a brief statement from the White House. It came days after he said that diplomatic efforts with North Korea have consistently failed, adding that "only one thing will work". President Trump has engaged in an escalating war of words with North Korean Dictator Kim Jong-Un, trading insults amid rising tensions between the two nuclear-armed rivals. The North Korea's missile and nuclear capabilities have made significant progress under Kim, who on Saturday told party officials that the country's atomic weapons were a "treasured sword" to protect it from aggression.